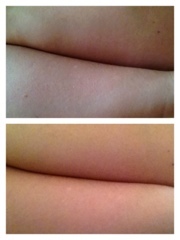 I'm a bit simplistic when it comes to self tanning. I only ever do it on really special occasions and I'm a St Tropez bronzing mousse devotee. I've been using it exclusively for about 4 years and even then I'm only about half way through my second bottle! That's how rarely I tan these days. So I was a bit intrigued when the lovely folk who represent He-Shi contacted me and asked me to try out one of their products I was intrigued. And a wee bit scared. I was even more scared when it arrived and I found that it was so shimmery. I mean look at it! So much gold! And the reds and greens and... So pretty. But also dark. I'm a bit intimidated I won't lie. But after a couple of weeks of staring at it I've finally plucked up the courage to dive in. So here is my review. 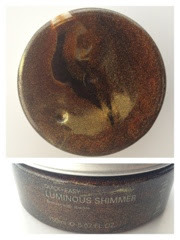 DESIGN: Not your typical tan bottle or squeezy tube, the luminous shimmer comes in a plastic tub with a tin lid so you can dip your hands/glove/face (each to their own) directly in. Its in between a gel & jelly in consistency and as you can see from the photos is jammed full of glittery shimmer in all sorts of colours. 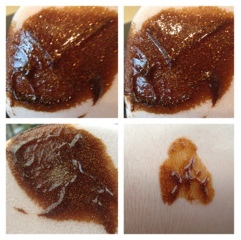 USE: When first dabbed on the skin it is intimidatingly dark and orangey but buffed out it becomes a surprisingly natural tan. The amount used in the image above covered one arm not including the shoulder. You lose a lot of the intensity to the shimmer during application which again makes it that much more pleasing to my eye personally but there is still a nice subtle shimmer that catches the light. I'll be honest and say I was quite conservative with my application (see pictures below) and could have layered it up for the more TANNED! look some people go for rather than the healthy glow I prefer. This isn't a developing tan and is very much water soluble so beware those wintery rainy nights and spilt drinks when you're going out but I wore this for a full day and it was still intact by the time I came to shower it off. VERDICT: Despite my original fears I'm really glad I tried this because it has resolved some of my instant tan/shimmer issues. I know now that I'm not gonna sparkle like a twilight character, nor am I going to look like a Geordie Shore cast member. 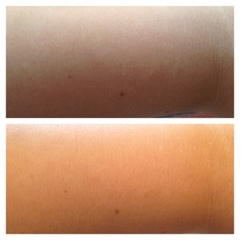 I can have a nice natural looking tan that is quick to apply, has minimal drying time and an added level of girly sparkle. Colour me impressed.